Big kids, fast kids, smart kids. Scholarship kids, walk-on kids. Nebraska kids, out-of-state kids. Spunky kids, tough kids. Myriad kids. Kids, kids, kids. 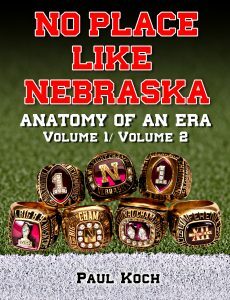 No, this isn’t my attempt at one-upping Dr. Suess, but, like a description of Tom Osborne from an earlier conversation, this is my breaking everything down to its smallest essence, to its most simplistic and unadulterated form. Football is details, details, details, all for that one ..extra.. inch. A fine example of that would be what you see in the appendix at the back of these volumes. 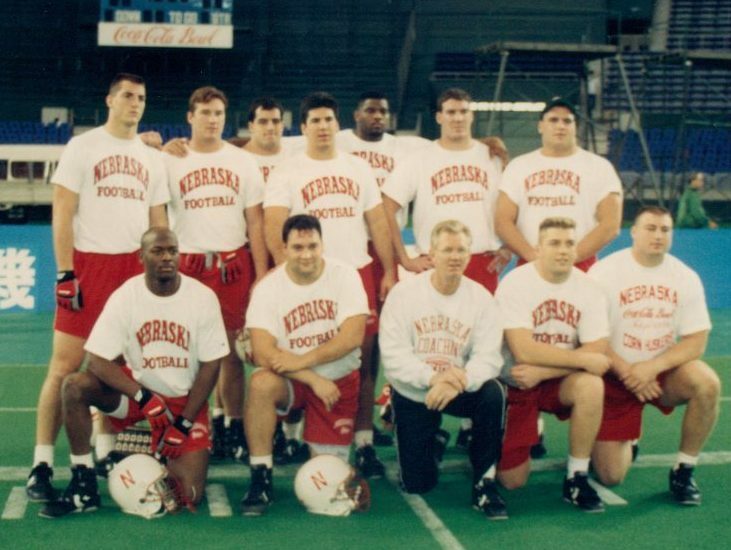 See a post from a few weeks ago to view the graphics and you’ll see one of the many detailed Performance Team progress tracking sheets of the 1995 team as it moved from its offseason winter conditioning into spring ball & summer break. Names have been removed to protect individuals’ privacy, but you will nonetheless get a feel for each and every player’s progress (or lack thereof), their physical hurdles, performance achievements, personalized summary and critical feedback as they headed into the last phase of offseason training. This was all in preparation for eventual emergence as the greatest, most dominant group of elevens in college football history. You might be surprised at what you see, as it becomes apparent that offseason has plenty of challenges of its own, autumn’s Saturday foes notwithstanding. Question: Hey Bill! So you were originally from Illinois, right? Bill Humphrey: Well, I only went to school in Illinois for two years. I had previously lived in Brussels, Belgium and got back to the United States and played a couple years of football when Charlie recruited me. Q: Was that due to parents in the military or what? BH: No, My dad was Director of Monroe Shocks/Europe, and I went to a school called the International School of Brussels. We actually had a football team that was comprised of about 60% American and a variety of different nationalities, Swiss, Scandinavian. We would travel around and play a lot of Air Force bases in Germany that aren’t there anymore. BH: There was Terris Chorney, too, who was from Canada. I ran into him at a home game recently when I was back there in Lincoln for a game. Q: So when was your first fall camp at the university? BH: My first fall camp would have been ’90. Q: Were you recruited by Charlie? How did that go? BH: Well, here’s the one thing out of the recruiting process that I remember: we signed a few guys out of Chicago that year, like Joel Gesky and Matt Jones, a quarterback out of Michigan City who later transferred out. We had Ed Stewart, Bryan Pruitt (who was a walk-on), and Johnny Mitchell. Q: (Laughing) Who woke him up? BH: I think Charlie woke him up there. We let him doze off. My mom and dad were always impressed by Charlie. So I went to Nebraska and signed on as a nose guard. BH: Yeah, we were running a 5-2 defense, and when we switched to a 4-3 they swapped me over to center because I don’t think they thought I was ever going to beat out Christian. And I don’t think we were very deep at center. Aaron Graham was a sophomore and I got swapped over when I was a junior. Jon Pederson from Grand Island ended up breaking his leg. Q: So Bill, when you first arrived on campus do you recall anything about those first few weeks? BH: Well, you know, I first took my recruiting trip out there, and when you get over Iowa and you start seeing the terraced farming, the patchwork and everything is in squares, and you just don’t see many lights when it’s dark out. When I got there I met Milt Tenopir and then I met Dan Young, and my first impression was that these were seasoned guys. I enjoyed it. That’s one thing that attracted me to it: everyone seemed straightforward and honest. There wasn’t a lot of elaborate to-do about everything. Q: Not a lot of highbrow, high-nose posturing or all the bells & whistles, huh? Q: Did you know any Chicago guys already when you arrived? BH: I’d met Joel Wilks on a recruiting trip to Northern Illinois. It wasn’t an official visit, but it was one of those weekends where you came in while they had a game. I met Joel and recognized him. He was actually my roommate freshman year. Q: You and Buddha (Joel Wilks), huh? BH: Yep, Buddha. (laughs) I remember they put us all in Harper Hall, and when you’re practicing all day and all you’re thinking about is sleeping at night, the first thing you notice is those damned train tracks. Those trains would come by at 2 in the morning and they’d be laying on that whistle. I remember getting with Pesterfield and Connealy and just drawing up plans to blow up that train. (laughs) That would have been sweet. Q: I spent many hours of my life waiting on trains at those tracks as I made my way over to the Devaney Sports Center weightroom, Bill. (laughs) So, was anything special relayed to you from the Nebraska kids? BH: Well, college football was always really big to me, because before I spent those four years in Belgium I lived in Columbus, Ohio. So college football -even though Ohio had two pro teams- Ohio State football was the biggest thing in my life. Q: So you probably have a lot of Buckeye shirts from when you were little kid, huh? BH: Yeah, I grew up a Buckeye fan. I lived and died with them. Q: Were you recruited at all by them? BH: Yes I was. I was recruited by Ohio State, and when I was recruited by them Steve Pederson was the recruiting coordinator at Ohio State. And I met John Cooper, who came from Arizona State where he beat Michigan in the Rose bowl, and I just didn’t hit it off with John Cooper. I’d known Earl Bruce, and Earl had recruited me to Colorado State. My sister’s parents-in-law had known him (Earl) and I probably didn’t start the conversation off right by talking about Earl to John Cooper (laughs), so we didn’t hit it off. But when I went on my recruiting trip to Nebraska, Tom not only knew my name right away, but he knew my family’s names, my sister’s name. So that was impressive. It felt like home at Nebraska. Q: Wow, so you had a unique experience as a D-lineman banging around against the O-line while Charlie is ripping on you your early years, and then you make the move to O-line and work with Milt and Dan? How was that role reversal? BH: Let me tell you, it’s a lot easier on the offensive side of the ball. When I was a freshman and a redshirt I spent my time going against Will Shields on scout team. Freshman ball was fun even though I kind of wish… it was a good experience, but it seemed like it ended up being a wasted year. Q: So, what would you tell me about Charlie if you wanted to distill him down to his essence? BH: Well, I had always liked what I read in his media guide bio. I can’t quote him verbatim now, but somewhere it said he would be the first man to jump you, but also be the first guy to hug your neck. And I think that exemplified him. I always appreciated “in-your-face, tell-you-how-it-is, let-you-know-where-you-stand”-type coaching. The most frustrating thing is guessing where you’re at. But Charlie always let you know. Q: Oftentimes in unflattering ways? Q: He didn’t mince words? BH: Oh, no. (laughs) Clear. If the best communication is clear communication, Charlie is a great communicator.